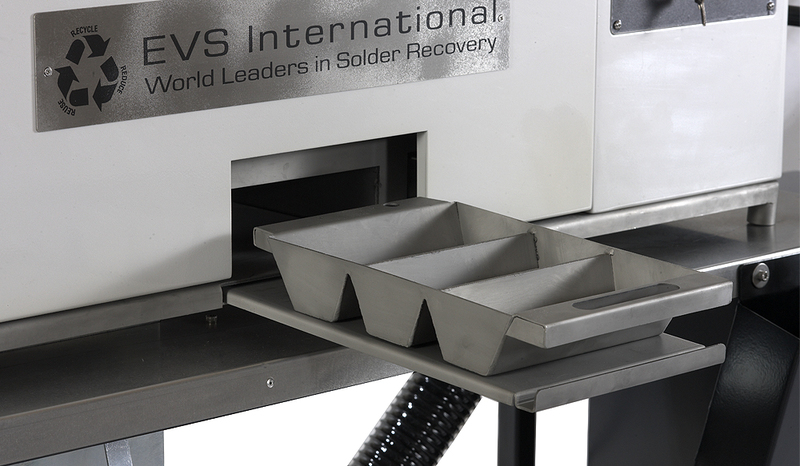 The EVS Solder Recovery System enables PCB manufacturers to recycle solder onsite directly from their wave solder machines. Without the use of any chemicals or additives the system typically cuts solder purchases in half while reducing dedrossing times and increasing safety. The EVS by Sono-Tek Solder Recovery System enables PCB manufacturers to recycle solder onsite directly from their wave solder machines. 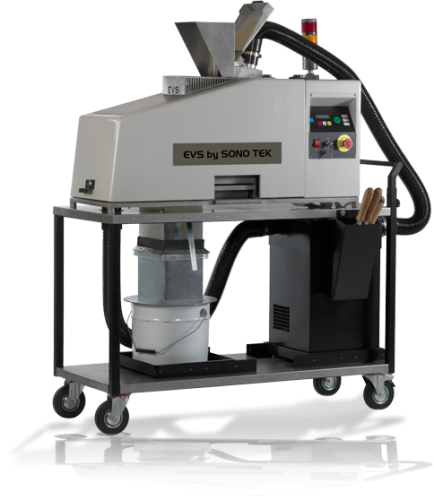 The EVS by Sono-Tek solder recycling system saves up to 50% in solder costs in the wave soldering process. Reduces dedrossing time by up to 85%. Rapid payback on its purchase price within months, not years. Recovers up to 75% on average pure solder by weight from solder dross, customers reduce the usage of solder in the wave soldering process by 50%. Low running costs: only a single-phase socket and a standard air line. Self-contained process avoids excessive handling of heavy, dirty dross, and a massive reduction in storage and transportation. Operates with an integral filtration system– filtering smells and fumes. Uses no chemicals, radiation, additives or other toxic substances. Reduces dross off site by up to 80%, recovering waste material on site at the point of manufacture, helping the environment. 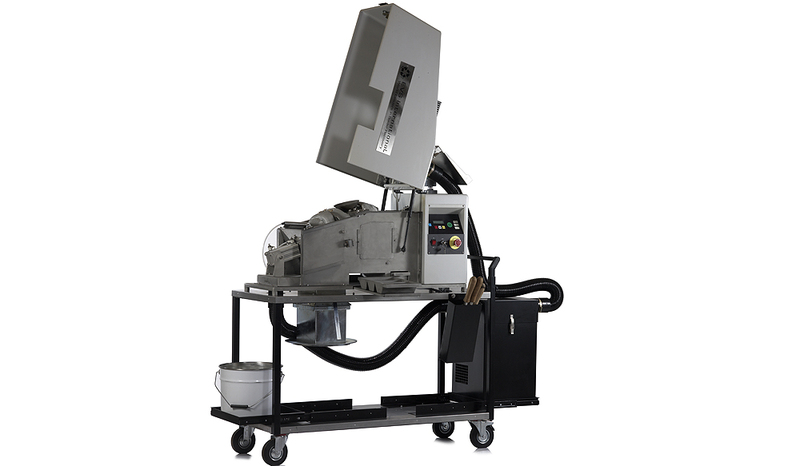 The Process: The EVS Solder Recycling System uses a patented process of heat and pressure inside a cylinder to separate and return your pure solder into the ingot tray. The remainder of the material is automatically ejected down a sealed chute into the dross bucket. Facts: Hundreds of solder analyses prove that the recovered solder is exactly the same specification as the solder in your solder pot. 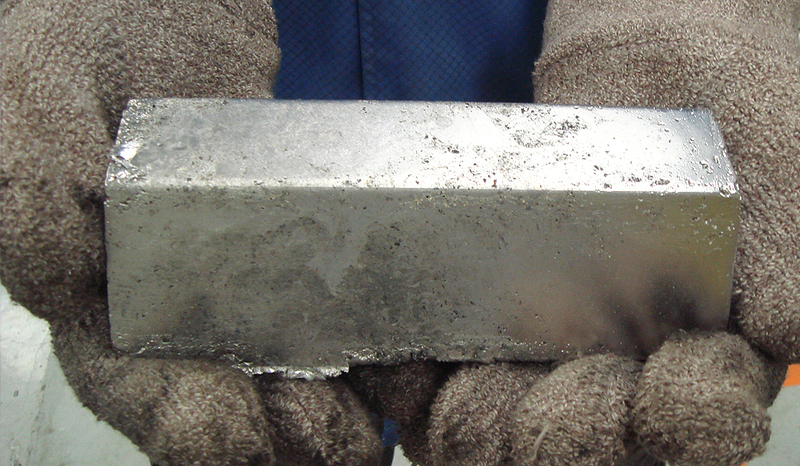 This has been documented by the solder manufacturers and confirmed by the International Tin Research Council. Support: EVS by Sono-Tek is supported by Sono-Tek directly for systems in the US and Canada – giving the same level of support and technical expertise to the EVS as we are known for in spray fluxing.